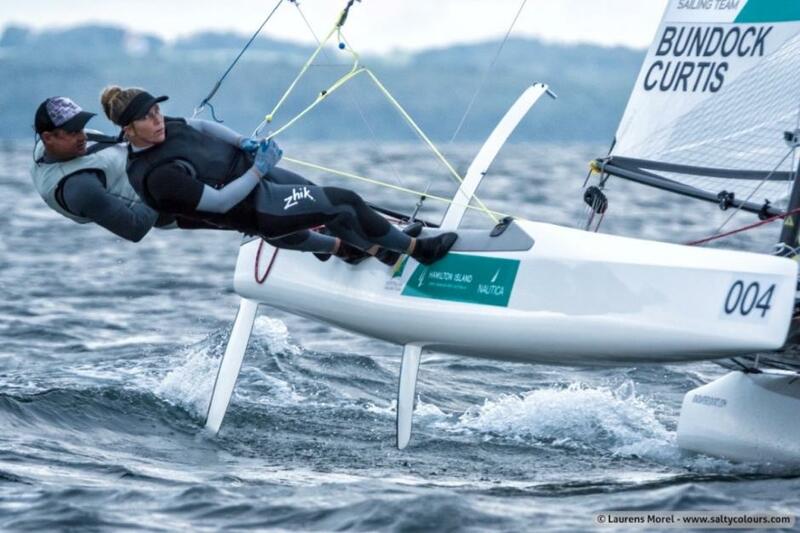 Jason Waterhouse (NSW) and Lisa Darmanin (NSW) have won the Silver Medal at the 2015 Nacra17 World Championship in Aarhus, Denmark overnight (Friday, 10 July). This is one place up for the two cousins after last year’s bronze medal at the 2014 ISAF World Championships in Santander, Spain and another medal as they campaign to secure a spot for the Rio 2016 Olympic Games. Three Australian crews are vying for the Australian spot at next year’s Rio Olympic Games, with ISAF regulations permitting countries only one entrant per nation. At the recent ISAF Sailing World Cup in Weymouth and Portland in Jason Waterhouse and Lisa Darmanin set the first mark by winning the gold medal, which put them into the #1 spot on the ISAF World Rankings. Olympic silver medallists Darren Bundock (NSW) and Nina Curtis (NSW) were not far behind winning bronze in Weymouth, but finished 16th at the World Championship in Aarhus. The third crew are Australian Sailing Squad’s Olympic medallist Lucinda Whitty (NSW) and Euan McNicol (NSW) who finished 13th in Weymouth and Portland and 20th at the World Championship. Nine races were sailed over the six-day World Championship regatta in Aarhus and crews were challenged with a wide range of conditions and only four sailable days. Waterhouse and Darmanin started the event with a race win and third place after the first day of racing, but a challenging day two dropped them back into fifth. After consistent results on the third race day they managed to climb up into second overall ahead of going into the double-points Medal Race. They secured the podium spot and Silver Medal with a fourth place in the final race, five points behind gold medal winners Billy Besson and Marie Riou of France. Besson and Riou were defending champions and now three time winners of the Nacra 17 World Champion crown. 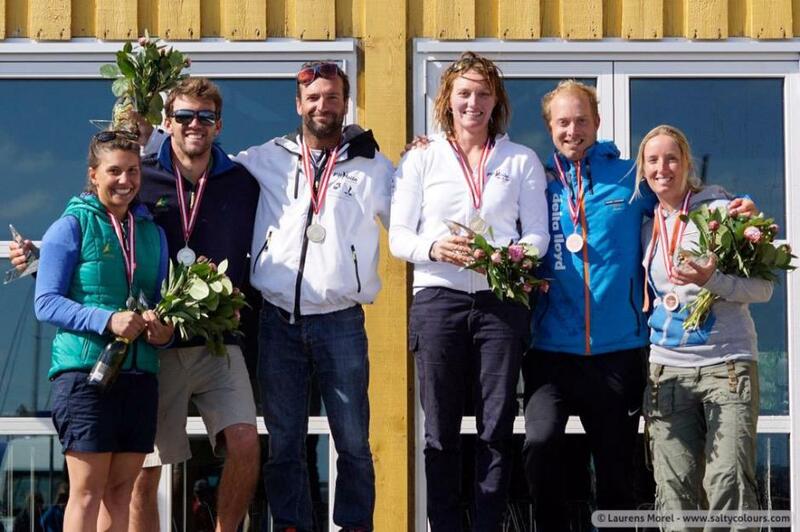 “It was an interesting Medal Race with lots of wind which has been the theme of this week. We had to wait a bit for the wind to settle, but we finally got the Medal Race underway in strong breeze and big shifts. Big thrills and spills with gust in the high twenties made for interesting manoeuvres and it was a tough balance to chase gold but protect silver,” Lisa Darmanin said after racing. “We’re really happy with second. And the improvements we’ve made since Santander have been fantastic. We’re now ranked number one in the World and now second in the World Championships. We’re moving up the ranks in our progress and our path to Rio and in a year’s time we plan to be in the gold medal position. During the regatta (5-10 July) fleets managed to race on only four out of the six days. The first day was cancelled due to no wind and after only one day of final series racing, day five on Thursday was cancelled for the top-33 gold fleet due to too much wind. Friday’s gold fleet racing for those not competing in the Medal Race was cancelled with only the Medal Race fleet getting a race in. This meant no opportunity for Darren Bundock and Nina Curtis as well as Euan McNicol and Lucinda Whitty to make up points, finishing in 16th and 20th respectively. As this was a selection event on the road to the Olympic Games 2016 and in the first instance for the Rio Test Event in August, Darren Bundock was disappointed on how it all went. The Nacra 17 crews of Jason Waterhouse and Lisa Darmanin as well as Darren Bundock and Nina Curtis will head to the 2016 Olympic sailing venue in Rio next for training. The Rio Test event team for August will be announced on 15th July. 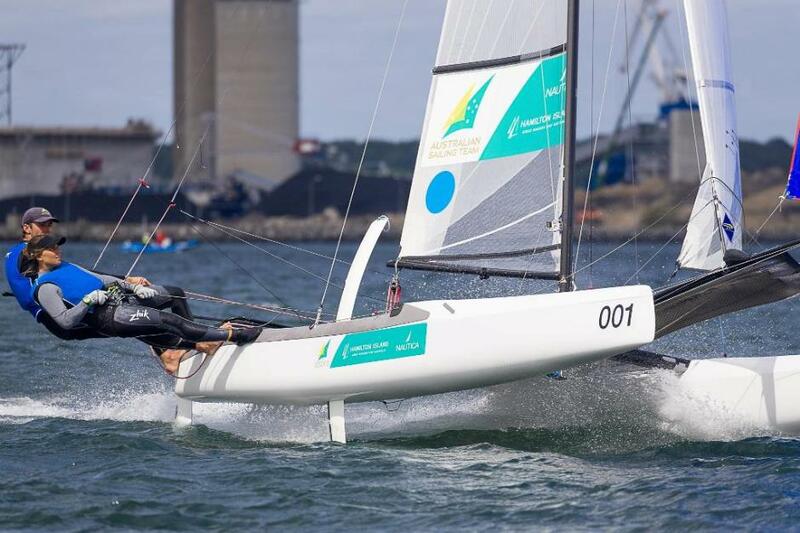 Four Australian Sailing teams, including Australian Sailing’s Youth Bridging team of Paul Darmanin (NSW) and Lucy Copeland (NSW) who finished third in silver fleet (36th overall), contested the 2015 Nacra 17 World Championship in the mixed multihull catamaran Nacra 17, which will premiere on the Olympic program in 2016. Report by Australian Sailing Team Communications, photos by Laurens Morel & Mogens Hansen, 2015.